Baking And Boys! : TWD—Bust! But Wait…Don’t Go. Rewind. Rewind. Rewind. TWD—Bust! But Wait…Don’t Go. Rewind. Rewind. Rewind. At least hear my poor, poor kitchen sob story, won’t you? First of all, with the crazy month it has been and the graciousness of our fearless leader to allow us to mix up the chosen recipes for the month, I saved the Chocolate Caramel Chestnut Cake until the end, actually knowing full well that I probably wasn’t going to make it. Sorry, Katya of Second Dinner. It looks divine, decadent and well, really just too fattening. I couldn’t do it. And, well, last year I bought and tasted chestnuts for the first time. They were fresh from our local Christmas farmer’s market. I roasted them exactly as instructed and I actually didn’t like them. at. all. So between that and hearing others mention how expensive it all was, I decided to forgo the cake. Katya’s looks great and her description of it all, especially chestnuts, makes me want to give them another try sometime. You can get the recipe for the cake on her blog. Now don’t laugh. I know I mentioned that the cake was too fattening and well I don’t want to know about any fat, carbs or calories in anything, because well, I decided to pick a TWD Rewind recipe that was made before I joined the group and in my looking over all the recipes, I. couldn’t. decide. Sigh. So I ended up trying three different recipes and not really loving any of the three. First, I thought I’d just make one of the cookies I’d missed. Simple enough. So I made the Chocolate Malted Whopper Drops. I wanted to use some malt I have that needs to get used. 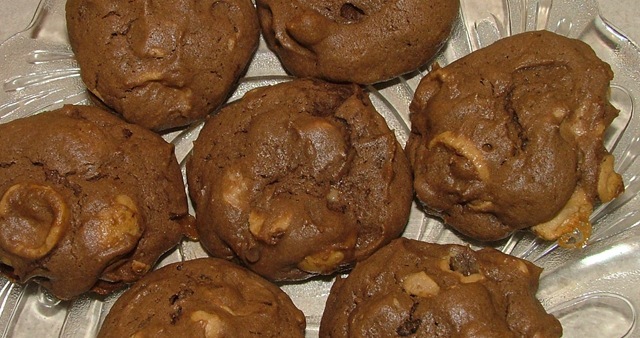 I’ve actually made these before with my little twist of using the Reese’s Peanut Butter Whoppers. And they were good. I made them last September just before I joined TWD. But when I made them this last week, I didn’t have any Whoppers, so I just substituted a bag of Reese’s Peanut Butter Chips and one cup of milk chocolate chips. And then, I don’t know what my problem is, but I didn’t take any pictures of them and I gave them all away. But for some reason, these were kind of dry and not nearly as good as when I made them last year with the Reese’s Whoppers. And is it just me, or is there NO oven temperature in Dorie’s book for these cookies? Page 85. Am I blind? Anyway, I baked them at 350 degrees for 10 minutes (the recipes suggests 11 to 13 minutes.) I think they would have been much better at only about 8 minutes. Just because I think we need a little photo interlude here, here’s a picture of the cookies I made last year. So not being satisfied with those (although they were eaten up and praised as really good, I beg to differ), I decided to make something else to post this week. Looking over the list of missed recipes once again, I decided to make the Brown Sugar-Pecan Shortbread Cookies, which were the first recipe chosen for Tuesday’s With Dorie almost two years ago. With my “lust” for shortbread cookies as of late (see my last post! ), I wanted to try these cookies with a little twist of brown sugar. Dorie’s recipes suggests putting the dough in a gallon-size zipper-lock plastic bag and rolling it out to the size of the bag. I just felt a little lazy and didn’t want to do that. So I rolled the dough into a square-shaped log and chilled it. Then I just sliced the cookies from the very uneven square-shaped log. I poked each cookie with a fork and baked them. They spread more than it looks like the cookies in Dorie’s book did. And I think I overbaked them slightly, even though I only baked them for 17 minutes and the recipe suggests 18-20 minutes. They were more brown than I wanted and turned quite crisp. I only baked half a recipe of these and I actually stuck them in the freezer, because even though they weren’t perfect, they are still shortbread and I would have still kept munching on them. Oh, you’d think I’d stop there, but NO. I just don’t know when to quit while I’m ahead. So Monday afternoon I decided to make something MORE chocolaty. Let’s just say, I bombed. I one and a halved the recipe and should have just left well enough alone. While I did all my math correctly, I then really stupidly still only put all the batter in the amount of ramekins called for in the single recipe. Ugh! So there I had four ramekins with 4.25 oz. of batter (too much!) and I made 7 cakes in my mini muffin pan. I meticulously weighed all the batter, then stupidly divided as if I was making 6 servings, when since I did the full recipe plus a half, I should have divided it by 9! Sigh. I really hate it when that happens. I followed the directions and baked the ramekin-cakes for 13 minutes. No more. I still hadn’t thought about the fact that these had too much batter in them. And when I took them out, I knew they were not done. I had not realized my mistake of putting too much batter in each one at this point when I could have solved the problem by just baking them longer. But I didn’t. I took them out of the oven. Cooled them three minutes and removed them from the ramekins. And I watched the lava really flow. This was all happening as I was also making a dinner that I was not happy with and I was not having a good time in the kitchen. Couple that with loud, bickering children and a two year old who didn’t take a nap and it was just not a good day. In hindsight, I should have just stayed out of the kitchen. We live and learn, right. I was quickly reminded that I stink at math or at least remembering to do math all the way to the final answer correctly. After baking dinner in the oven for about an hour, that is when it dawned on me that I had too much batter in each ramekin. So what did I do? I scooped each “cake” back into the ramekins and decided to bake them longer/more/again. So with the first thirteen minutes, I baked them another thirteen minutes and called it good, or bad, but done. As in, I was done. Besides, dinner was ready. Then to top it all off, my nice camera is not working properly, super bright flashes of light right on the subjects being photographed. What does that mean? Here I tried to photograph my darn-tootin’ cute lil’ two year old completely peeling his own Cutie Clementine. He was so proud of himself. I love those Cutie Clementines! But what’s up with the camera? Anyone? This one isn’t too bad. This one, bad. He has no nose. Here’s the Gooey (Way underdone) Chocolate Cake. It looks like a toilet seat with well, I won’t say it. Sorry. What is wrong with the camera? Just made me even more annoyed. And when Kevin can’t figure out an issue like that with something electronic, that’s not good. So I took a few pictures of the cakes with his little, tiny digital. The above photo is before I decided to bake them a second time. Here’s the final product. Still cruddy photography, that’s because it was already dark outside. I’m done. Here’s a mini one baked for only six minutes, they were pretty good, but these cakes were, I can’t believe I’m going to say it….wait for it….too chocolaty. ?? I just need a simple brownie or a couple M&M’s and I’m good. Scott ate the big one in the photo AND the little one and declared he was full! Whew. And when it’s dark outside and you have really bad lighting and you stink at photography, lessen learned, don’t put your food subject on a white plate. When I read that you didn't like the cookies but everyone else did, I began to wonder whether you're experiencing what I am. After 50+ Dorie recipes my palate is spoiled. Nothing is good enough for me. Though everyone else is still happily eating dessert. I plan to try both those cookie recipes for the holidays. And add the chocolate drizzle! Glad you cleared that out at the end, I actually thought you made those all in one day ;). We all have bad days in the kitchen (or weeks)... I' sure all you baked was very much enjoyed, don't be too hard on yourself Katrina!!! Whew! I'm worn out just reading that! I've had a couple of big time bombs in the kitchen lately - I think the moon is out of alignment or something. Anyways, no one liked the whopper cookies in my house either, so I doubt it was you. As for the cake - eh, live and learn. And look forward to a new day in the kitchen! Treeni...email me about your camera. What kind of camera is it? What settings do you have it on? I might be able to help. Yikes! that sounds like a frustrating day of baking! Everything looks delicious even with the brightness issue. I hope you get that figured out soon. That's one dedicated TWD blogger to make THREE recipes in an attempt to find baking happiness. I don't know what kind of camera you have but did someone fiddle with some of your settings without you realizing it? Is it wrong that I want your toffe pecan shortbread cookies for dinner tonight? Now go get some rest, OK? Loved seeing your little boy wearing his true blue T shirt. Go BYU! WOW! I thought everything was made in a day. Hahaha you are so funny. I love your blog. I have no clue what's wrong with your camera. I hope the problem magically goes away. Tomorrow is another day in the kitchen. I hate having a bad day, but there are better days and taster recipes ahead! I hope you have a Happy Thanksgiving! I love the chocolate drizzle on those cookies. Mmmm! Lol. We have all been there. Seems like you were able to keep your sense of humor, a very important aspect of cooking! Have a wonderful Thanksgiving Katrina. Happy Thanksgiving! You are the champion drizzler...I don't know how you get that drizzling you do to look so darn perfect every single time! Fun reading about your kitchen adventures always. Laughing at the camera shots and comments by you. My goodness lady have you been baking up a storm! All of your goodies look so good. And you have been also baking for TG..you go girl! Who went to BYU?I see your little guy has a BYU t-shirt on. We live close to Utah and a lot of people from Pocatello(where I live) end up going there. Wow! You went baking crazy! I love the cookies with the chocolate drizzle! Sorry the chocolate cakes didn't work out. They look like they could be amazing though! I'm so sorry your chocolate caper ended badly! I've wanted to go back and make things that were picked before I joined, but I have too much trouble baking the things I'm supposed to be making (like tomorrow's pear tart, not started, not done, probably not happening). I hope your camera realizes its job is to make your food look as good as it tastes!